March 2019. 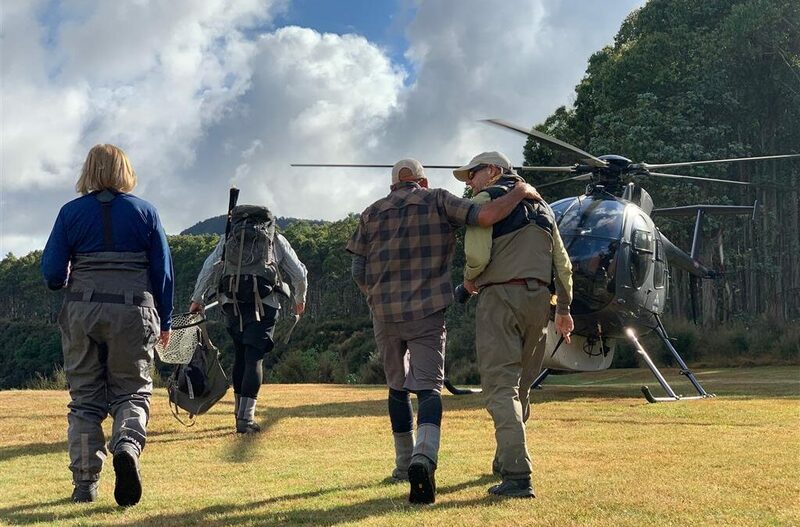 I was fortunate to accompany a small group of anglers to the north island of New Zealand on an unforgettable journey of wilderness, trout, and great friends. What ensued was a trip that we will always remember and one that left us with the indellible desire to return. I recall the last time I was in New Zealand, on the South Island, which was my first time to the country, I experienced a strange anxiety days before my trip ended, as I was enjoying the fishing so much I just couldn’t bear the idea that there were only a few days left! 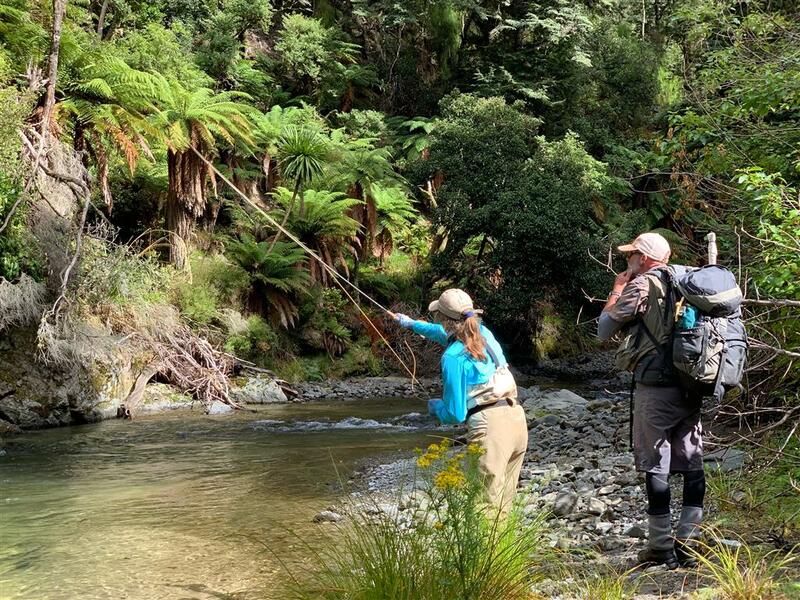 Our group had a week’s fishing out of Poronui Ranch, located in the Taupo region of the north island. Poronui is one of the longest-running fly fishing operations in the country and has a rich history of catering to the traveling angler. They were perfectly-suited for our group and extremely well run. The lodge began as a simple house that hosted anglers and has grown over the last 25 years to a much larger operation, still centered around fishing. Now, they also offer a good deal of non-fishing activities. On the day of our arrival, we enjoyed shooting some sporting clays and discussed an array of options for the rest of the week should the fishing for some reason turn foul. Among these options were organized wine tastings, manuka honey tastings, more sporting clays, or a drive out to hear the stags in rut in the evening. As it turns out, the fishing never faltered enough for us to even consider doing any of these things! In Taupo, the word from the transfer driver was that it had been a hot summer and that fire danger was really high at the moment. This put the idea of small, low water and super spooky trout into my head right away. A lifetime of fishing makes one draw parallels automatically when certain pieces of the puzzle are identified, and I, without thinking, began to prepare myself for technically demanding fishing. In this case we were to be pleasantly surprised, the effect of a long and dry summer was different than I imagined. The morning of day one found us standing on the back lawn of the Blake House, an exclusive property on the ranch perfect for our small group of close friends. We met our guides, veterans Dave Wood and Sean Andrews, who would fish with us for the week. We knew we would get along famously with these guys as soon as we met them – terrific people with great personalities! We were getting acquainted on the lawn as we heard the first helicopter approaching, much to our surprise, it landed right behind the house and the first anglers and their guide climbed aboard. Twenty minutes later the chopper returned for Sean, Lisa and I. A new experience for all of us, we were all feeling a mix of excitement and concern. About two minutes in, excitement squeezed all concern out and we were enjoying the ride of our lives, flying low over a very rugged landscape. This day’s fishing was selected as a warm up day, and we flew to a river with a good concentration of both rainbow and brown trout. It was a great day designed to shake the rust off of the anglers that hadn’t touched a rod for a while. Lisa and I did a mix of blind fishing and sight fishing, and caught fish with both methods. This was a fabulous day of trout fishing with us clamoring over boulders, walking up gravel bars, and stalking the edges of long, emerald colored pools. It’s hard to describe the sensation I felt as the helicopter landed on a tiny gravel bar in the middle of the river to whisk us out of there. We were back on the Blake House lawn less than twenty minutes later where we were greeted with cold beers and lots of smiles. A lifetime of backcountry wandering has built into me the mentality of “what’s been walked in must be walked out”. To poke along this wilderness river and be carried out so quickly and efficiently is truly a luxury and a treat. Back at the Blake House, we made a quick decision that we would be flying in as much as the weather would allow! On the second day, we awoke to rain and planned on fishing right on the Poronui property. We decided to all fish together, taking turns and watching each other each time we had a fish spotted. This was a great day to introduce the concept of stalking trout and fishing this way. Most of our group had the idea before the trip, but it’s another thing to put it into practice. The weather threatened to get ugly all day long, but never really did, and we enjoyed a great day on the water, with several huge trout hooked and several more spooked. Lots of laughing and lots of fun! Although we didn’t see more than a dozen trout all day, everything we spotted was 5-8 lbs! I would gladly take that any day of my trout fishing life! The following day, our guides showed us an incredible day on a small stream that flowed through a heavily vegetated canyon, which I’d describe as a temperate jungle river. I spent the day fishing with one of my all time favorite fishing buddies, one with whom I’ve shared some unforgettable experiences in both Yellowstone Country and internationally. She’s a good and instinctive angler. Lana and I waded up the stream and spent the entire day rotating shots at rainbows from 3 to 5 pounds. We found one in every other or every third pool. The river was only 20 to 30 feet across and the trout behaved as though they’d never seen a fly. We clambered up boulders, around small waterfalls, under fallen trees and over others. Days like this make for happy anglers, and we were grinning ear to ear for all of it. Every time we would finish a pool, a brief shot of sadness would arise in our minds, but a quick look upstream always revealed the next pool, and a childlike sensation of excitement made our imaginations beg to know what lay ahead. Rivers like this bring out a youthful exuberance for exploration that is difficult to tap in other experiences. Rivers like this make anglers fall in love with fishing again and again. 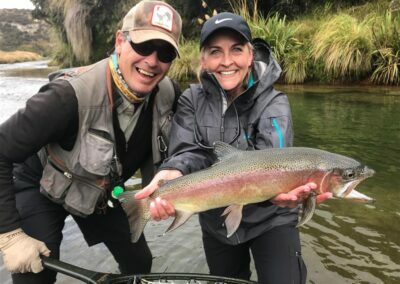 It is on this river that we realized that this entire experience in New Zealand is truly “Disneyland for flyfishing adults”. At the end of this beat, we were greeted by a smaller helicopter, the 500, which the pilot skillfully put down on the inside of a river bend with the tail overhanging the water and the rotors only feet from the nearest tree. We climbed aboard and after 25 minutes of lifting on thermals and cruising over various river valleys, we once again landed at the Blake House, literally 30 feet from my bedroom. This heli fishing is the closest thing we have to teleportation in the angling world! On day four, we flew out to a place the guys called “Mystery Creek”, named so because at one point the water gets so low there that it’s a mystery why there are any fish at all in there. Quite honestly, I felt mystified by the water, or lack thereof, and by the places that these giant kiwi trout would hold in. The absence of predators really makes them comfortable in unusual water by our Montana standards. On day four I fished with John, who is quite a good caster and angler. It was sure fun to spend the day with him and watch him make great shots at these fishy targets. The water was just small enough, with each pool separated from the next by a long shallow boulder field and a short, mid-depth run. I commented to our guide, Sean, that I assumed the trout would stay in their respective pools during the battles. He chuckled and replied…”not usually,” with a slanted smile. Not long after this exchange was spoken, John was into his first fish and the battle stayed in the long pool where the trout was hooked. A short while after, right before we thought we might have a moment to net him, the rainbow took a hard run towards the shallows at the bottom of the pool and soon enough John was running down the river bank trying to keep up with the speeding bullet at the end of his line that was headed for the next pool, some 100+ feet away. A great battle followed and we finally put the trout in the net. We were already cackling with laughter! The day continued like that with almost every trout taking us either up through the shallows at the head of the run into the pool ABOVE, or ripping us down into the pool below. We landed our share of large trout this day, with the biggest coming close to 25 inches. Just what these giant trout are doing in such small water is totally counter-intuitive for us, but man, is it fun! Again, the helicopter showed up and zipped us out of there so quickly. We had cold beverages in hand and beaming smiles on our faces less than 20 minutes later. Day Five. Rangitikei River. We had thus far fished only on rivers I had never heard of and they were all incredible. Our guides, Dave and Sean, both had mentioned that this river was a must on the list, and it was the one on our itinerary that I HAD heard about. Many years ago, a good customer of mine who was a well-traveled NZ angler mentioned this one to me and said it was something I must see in my life. He was absolutely spot on. The Rangitikei is a larger river, about the size of the Gallatin in the canyon upstream of Big Sky. A good place to be able to make a 50 to60 foot cast. I had the pleasure of fishing that day with Lisa, who possesses the spirit of all great anglers: patient, calm, observant, and persistent. She had the least amount of experience with long casting scenarios but was up for the challenge. I truly appreciate someone who can step up to the plate with an 8 lb trout and deliver without a trace of nerves, regardless of the outcome. She’s a stone cold trout slayer. Lisa’s chances for the success came early in the day, with several enormous fish eating her offerings in the first two hours. Two hooked and two missed, the two hooked found a way to come unbuttoned. But that’s the way fishing is sometimes.. My shots on the Rangitikei were a combination of strange drifts and a bit of good fortune, and I got lucky with a few trout landed that I’ll never forget on dry flies and one on a dropper. Two of these took me into my backing twice, something no trout has accomplished with me for a few years. I am historically pretty stingy with the silk. I was repeatedly thankful for the strength of the Trouthunter 4X fluoro tippet attached to my leader, no question the strongest 4X out there. Our group landed two fish over 27 inches that day, and we all had shots at trout that were larger. I like to think that I have a river of dreams on every continent, and the Rangitikei is it for me on this. I will return! Our sixth and final day on the North Island was another one I’ll never forget. Lana and I set out on this adventure together, and it started with a bang. Lana landed several great trout before we finished the first couple of hours. The battles were good and long enough to be filmed in four-part mini-series on my iPhone, complete with jumps and long runs up and down the banks. By noon, we were literally cackling with laughter when we hooked up and had to run these trout down to bring them to hand. They all took us for a hike and they all ate dry flies. These are the days you remember…so good that your greatest memories are the belly laughs and good times that you experienced, more so than any one particular fish! We fished a swift and shallow run above a raging rock garden and severe drop in the river. Every single fish we hooked in this area took us on a downstream run, forcing us to navigate a 70 foot section of river with large boulders at the top of a 4 foot vertical drop. An exhilarating angling experience that we repeated 6 times with 6 great results, laughing the whole way! Flyfishing is an incredibly satisfying way to plug into the natural world around you, and days like this remind you that it is really, really, really fun! Again, “Disneyland for flyfishing adults”. I’ll admit it. I am an insatiable angler. Give me one great shot and I’ll crave another. Show me a good day and I’ll happily spend weeks trying to see what a great day is. I just can’t get enough. Guiding has helped me learn to relax a little and enjoy fishing through the experiences of others. I’ve gained a lot of insight and fishing wisdom by watching others do something their own way that I might do differently. It has helped me as a flyfishing father to more slowly and patiently introduce my children to the game which I enjoy so much. New Zealand is a wonderful place to experience this. It is a place where one can be part of the experience without being the one with rod in hand. It’s a cinematic experience out there: the walking and stalking, the spotting of a large trout finning in the prime lie of a pool. An angler selects a fly, moves into position, makes a long cast that must land properly, and then the fish spooks or the fish plays. Everyone gets to be part of the drama, the agony, and the elation. This kind of fishing is teamwork. I ended the week a satiated and content angler…with a very strong desire to return! 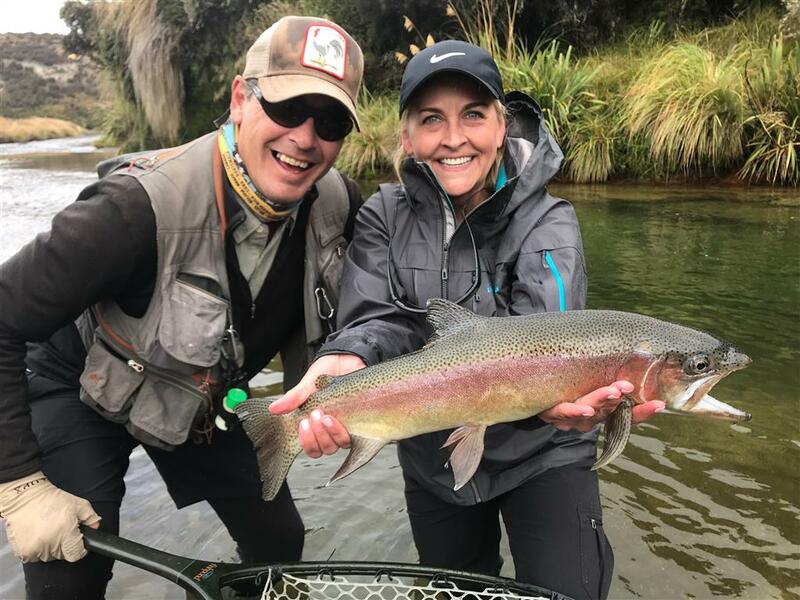 Fishing in New Zealand is an experience that I think most fly anglers that are sight-fishing enthusiasts should have on their bucket lists. The fishing we had is not as diverse as one might find in other venues, but it is extensive and, of its sort, it is simply the finest in the world. There are far fewer trout in most of these Kiwi rivers than what we’re accustomed to in the American West. While our rivers might have 3000+ trout per mile, these rivers might have 10. They are 10 enormous trout, but they must be hunted. There is no question that it is high stakes trout fishing, and it is the best of its class. Many describe these fisheries as “technical”, and I would say that they are, in a mechanical sense. To take the greatest advantage of these fisheries, an angler would do well to be proficient at 50 feet with a 5 weight rod equipped with floating line. I would also note that many of our shots on smaller waters were within 30 feet, and most anglers are not prepared to cast that SHORT of a distance with a 12-14 foot leader and do it accurately. These are the skills you should have to make the most of your New Zealand experience, and they are not at all unattainable. The “technical” here is not in an entomological sense like it might be on Idaho’s Henry’s Fork or some of Pennsylvania’s “technical” spring creeks. You don’t get to work these fish in New Zealand, you get to put one shot on them and hope you don’t spook them. When they spook here, they simply “shut off”. Time to move on. The organization of the guides and anglers in New Zealand has always been a subject of interest to me. 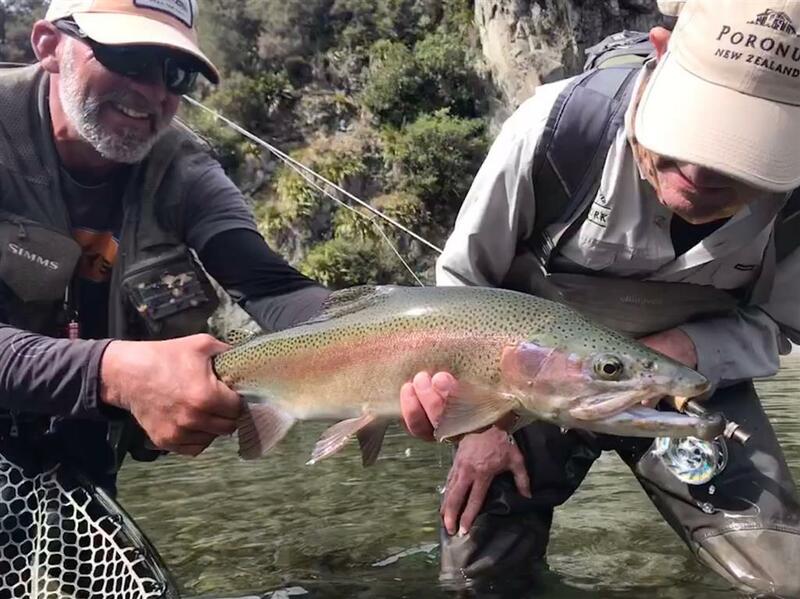 Due to the nature of this kind of fishing, the kiwi guides pay close attention to when the last angler walked any particular beat. They generally agree on a “rest and rotation” schedule that will rest waters anywhere from 4 days to THREE WEEKS between angler groups. This helps to allow for more relaxed fish and for them to be more eager to take a well-presented fly. It is an interesting way to manage fisheries and one that shows results in this environment. All in all, our trip to New Zealand was about as perfect as you could imagine. 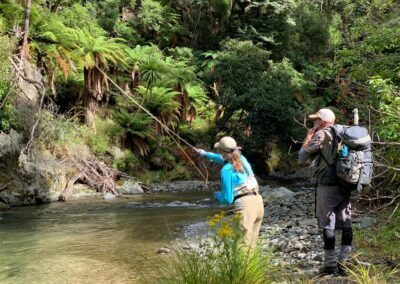 The “Disneyland for flyfishing adults” aspect is too great to be ignored, and the warmth and hospitality of the kiwis is too welcoming to never experience again. Not everyone will be able to enjoy helicopter rides in and out of the fishing venues, but every angler can be treated to a special experience of hunting for trout in an amazing wilderness setting by walking a little slower and watching a little more closely. This angling rewards skills that are attainable by the motivated angler.